From the Chaldeans and the Medes, the Chinese Mandarins and the Mongolian shepherds to the Kuwaitis and the Bangladeshis, economic asymmetry is a historical fact. In modern times, asymmetry is characterized by collusions and collisions of sovereign states and international finance: first, the combination of Western nation-states and capitalism and their colonial and imperial hegemony, then the claims of newly sovereign developing countries to control their national economy and to market their natural resources, with such consequences as the global energy crises. Sovereign rights have contributed to the compartmentation of the means of production and accentuated economic asymmetry. As a possible solution, a global internationalization of natural resources similar to the Law of the Sea Treaty provisions for the exploitation of the oceans, though chimeric, is worth pondering. The year 1973 will go down in history as one of the pivotal dates. It was the year when oil-producing countries turned off the valves and realized that they could get away with it. The Marines did not land. The event changed the dynamics of the relationship between the Western industrial nations and the Third World. A good deal of sovereign arrogance changed camp. From October 1973 to January, the price of oil quadrupled. Algeria, Indonesia, Vietnam and other countries had long since gained independence, but although economic exploitation was at the root of national liberation revolutions, what they mainly emphasized was political independence. The failure of Mossadegh to nationalize Iranian oil in 1951 and Arbenz to nationalize United Fruit Company in Guatemala in 1954, the combined Israeli-Franco-British operations of 1956 in Suez, and the overthrow of Allende in September 1973 were indications to the Third World that Western governments would not tolerate challenges to the Western economic hegemony without a fight. The weakness of the U.S. economy in the aftermath of the Vietnam war, her reticence to get involved in conflicts overseas and her preoccupations with Watergate, the heated world economy of the early seventies combined with world monetary instability -- partly due to U.S. government's monetary policies -- compounded the effects of the October 1973 events (when the Arab oil-producing companies shut off oil supply to the West in support of theYom Kipur war). Those events, among other things, further emphasized two realities: I. The realization by the international finance and multinational corporations of the relativity of sovereign nationhood and the vagaries of depending on it whether as a home or operating base  , a fact which, in conjunction with the new awareness of host governments, permitted the oil companies to negotiate agreements to pass on to the host countries -- in most cases against generous compensations and controlling service contracts -- the ownership of the operations in those countries  ; and II. The irrationality of the concept of sovereign nationhood which could account for Bangladesh with a population of 90 million having a per capita GNP of $90 and going bankrupt, and Kuwait with a population of 1.3 million having a per capita income of $17,000 because its people happen to be sitting on a rich oil field and claim it as their sovereign property. A new kind of economic asymmetry was thus growing due to new national sovereign claims. The more classical asymmetry was, of course, the one which had been caused by the growth of sovereign nation-states in the West, its coincidence with mercantilism and capitalism and their colonial and imperial consequences.We should add, however, that before the creation of economic asymmetry by colonialism there was economic asymmetry between the Chaldeans and the Medes, the Egyptians and the Ethiopians, the Romans and the Gaules, and the Mongolian shepherds and the Chinese Mandarins. In other words, economic asymmetry is a historical fact and depends on economic, political, social, cultural and traditional conjunctures. The classical economic asymmetry caused by colonialism and imperialism, however, is classical in that it systematized what was in essence the cause of asymmetry in general, i.e., the discrepency between the levels of economy and the accumulation of wealth and its use (from the subsistence level of Aborigines of Australia to the international finances of Wall Street). It made use of capital in a productive process which accentuated the asymmetry. And it could do that due to its capitalist ideology, its development in the context of the Western culture and the dynamics of its encounter with other cultures. Western industrial capitalism in its world expansion did not -- and could not -- apply its competitive free enterprise techniques. Following the more or less traditional and universal pre-industrial patterns, the earlier relations of the emerging Western European countries with what we now call the Third World were mercantile and military. The British government was chartering the East India Company as a commercial company and was also investing its capital in gunboats, which made the East India Company more competitive in the foreign markets beyond pure economic market mechanisms. While due to different conjunctures the traditional patterns in the West were evolving towards modern industrial societies, they were not doing so in the Third World. Thus by the middle of the 19th century, when capitalism was in full bloom, the relationship of metropolitan states and colonies had already prepared the grounds for imperialism. That is, the relationship between the different components of the means of production, i.e., capital, labor, raw material, technology, and management in the dependent territories was rigged by a political control and a master/ indigenous dictotomy. The situation of labor in the metropolitan countries was not much better than that of the colonies at the beginning, but it evolved within economic and political contexts which permitted Western labor to negotiate and claim its worth as one of the essential components of the means of production with fluctuating value, and led to socialist and trade unionist movements in the West to control the price of labor. Further, colonial powers had created controls and tariff barriers around their possessions which handicapped free competition in the world market. Even countries like the United States, which did not have politically defined colonies, adopted the process, starting with the Monroe doctrine and evolving into the support of banana republics--although not as successfully as colonial powers. Hence the advocacy of "open door" policy. The political grip of the colonial powers did not permit -- even if it were possible -- the development of an industrial market economy in the colonial and semi-colonial territories and thus acquired an exploitive character. The miners of Katanga (present-day Shaba) were never treated like those of Liège. The political warp of colonialism had certain consequences which we need to scrutinize in order to see whether they were inherent in the colonial system or symptoms of other aspects of development and underdevelopment. For one, then as now, most of international capital investments were made among the "developed" countries and in areas which had potentials for development. By late nineteenth century, the Balkans, Russia, Spain, and some Latin American countries, such as Brazil and Argentina, were "developing" and not directly colonized. The capital flow to colonial territories was from the "Mother country" and even then, as in the case of the United Kingdom, they were mostly made to the "developing" areas such as Canada. The pattern suggests that the factors which enhanced the flow of capital were not only the relative combination of political control -- security and predictability -- and economic potentials for investment; but also a certain degree of cultural compatibility in the sense of the potentials of the social system and the labor force to adapt to industrialization and modernization. As we noted earlier, while the conjunctures in the West led to industrial revolution, they did not do so in the Third World. Whether industrial revolution would have taken place in the non-Western cultures if Western colonial hegemony had not thwarted their economic evolution cannot be answered. Cultures have evolutions peculiar to themselves. As the Chinese said; they had invented the powder but not the gun, and had discovered the compass but not conquered the world. On their road to modernization and industrialization the traditional societies have had -- and still have -- not only the impediments of imperialism but also their own cultural patterns to overcome. Nowhere in the West did the distinction of aristocrats and "learned" people as upper class become so acute as to make them grow their nails so long as to handicap the use of their hands, signifiying that they need not engage in menial occupations. The upper classes of many Third World countries are still averse to manual labor and physical excertion for productive purposes. Their conception of wealth and economy also still reflects the traditional land holdings, trading and exchange, as distinct from capital intensive industrial production. These characteristics have not helped the upper classes in developing countries to raise the technical and industrial consciousness of their basically rural population. Many developing countries show symptoms of these cultural characteristics. Some have tried to overcome them through radical solutions, such as China, others through technical assistance, still others by new blends of tradition and ideology such as Burma. These classical political, financial, and cultural factors of economic asymmetry are the part of the fabric upon which the post-1973 developments took place. The list of investments made by the OPEC countries in the U.S.A. since 1974 show that most of the early investments were made in real estate, hotels and banking. Only more recently OPEC capital has been seeking industrial investments. Petrodollars have followed the general flow of capital and while often used speculatively, have been invested in Western industrial countries. Further, oil-exporting countries have used 44% of their petrodollars for imports from industrial countries as compared to 8% a from developing countries . These orientations of OPEC surplus money have accentuated the economic asymmetry and have put to the test the existing mechanisms of capital investment. Broadly speaking, these mechanisms include official development aid provided by governments, multilateral institutional loans, commercial bank loans, capital investment by private corporations, and capital investment in the form of joint ventures between private corporations and investors or governments of host countries. Direct private investment in less-developed countries (LDCs) , which had been growing in the fifties and the sixties, declined in the seventies (see chart below). The need for expensive oil by non-oil producing LDC deteriorated their balance of payments, which induced developed market economies to raise their aid programs. But that aid fluctuated as the developed countries themselves faced the effects of raising oil prices. The oil-exporting nations with capital surpluses were also in a position to provide aid. That aid also fluctuated depending on the economic and political conditions in the oil-producing countries. International agencies also provided some help, such as the International Monetary Fund's subsidies to interest rates for financing oil imports of the LDCs. There was, of course, the problem of absorption of the surplus petrodollars--the current account surplus of oil-exporting countries rose from $4.1 billion in 1973 to $62.2 billion in 1974. Banks in the industrialized market-economies handled this surplus and redirected part of it to the developing countries needing loans to pay for oil. Commercial bank loans became the more substantial part of the international transfer of capital--from $32 billion in 1970 to $284 billion in 1980. While the official aid from developed countries to LDCs is at low interest rates and concessionary, commercial loans to developing countries are at floating rates generally at some 5/8 to 13/4 percent above the London Interbank Offered Rate (LIBOR). These loans are mostly made to countries which the banks feel are creditworthy--i.e., have growth potential, such as Korea, Brazil and Peru; or have natural resources, such as Zaire; and oil-exporting countries whose oil exports do not provide them with a capital surplus (Algeria, Mexico, Venezuela). As shown in the chart below, the tendancy has been towards increasing commercial loans to these countries. And the banks have not always been right in calculating the potentials of their borrowers for payment; in which case they have had to reschedule or refinance their loans. Debt rescheduling by commercial banks has been arranged for such countries as Argentina, Jamaica, Nicaragua, Sudan, Peru, and Zaire. Debtor countries also fail sometimes to meet principal and interest payments on official aids by other governments. The rescheduling and refinancing of such loans are done by the Paris Club which, as an ad hoc body created by creditor governments, has involved commercial banks more and more in its relief programs since the '70s. The events of the 70s disproved some of the "gap" theories of the 60s. Savings and exports did not catch up with debts and imports in many LDCs.. Indeed, the deterioration of the LDCs' economies gave rise to new scrutiny of the theories linking the growth of domestic savings and capital formation to foreign investment and aid. But the emergence of petrodollar states gave new significance to another kind of export and savings by LDCs, namely, labor migration and remittance of its savings to the home country (see chart). The movement of labor across the frontiers had already reached considerable proportions. in Europe in the 50s and 60s. The movement of labor from the LDCs to the capital-surplus oil-exporting countries in the Middle East in the 70's -- reaching some 4 million migrants who transferred some $4 billion to their country of origin in 1980--emphasized the potentials for world wide mobility of labor. It should be noted, however, that the labor which is imported from LDCs includes a high percentage of semi?skilled laborers whose drain from the home country reduces the chances of the home country to attract foreign capital for its own development. It was the existence of such labor force which made Hong Kong, Singapore and South Korea attractive for foreign investment and eventually prosperous. The picture in front of us, as we move into the 80s, suggests a flow of direct private investments mostly among industrialized free market economies, commercial bank loans with floating interest rates mostly to developing countries which the banks consider -- not always accurately -- politically and economically creditworthy, shrinking official development aids constituting the main source of financing for LDCs; petrodollars of capital-surplus oilexporters largely invested in non?industrial sectors of industrial market economies and labor in the capital?surplus Middle Eastern oil?exporting countries imported from the LDCs. Except for the relatively small portion of concessionary loans in the form of official development aid -- which have, of course, political overtones -- and multilateral aids administered through international institutions such as the World Bank which offer low interest rates but control projects for their overall developmental validity -- a fact which, at times, creates bureaucratic inconsistencies and which many LDCs resent as an infringement on their sovereignty -- the bulk of international finance by commercial banks are at rates which, if persisting at present levels, will, in the long run, drain the borrowing economies rather than develop them. Direct private investments by multinational corporations in LDCs -- which have declined in the 70s -- can also, over a period of time, have adverse effects on the overall development of a LDC when they are not integrated into the economy of the host country. A look at the balance of payments and debt service ratios for some such countries will make the point. This picture does not present economic balance. In order to better understand its evolution, we need to look at some further socio-political factors. While Western industrial free-market economies are moving towards internationalism and a network of international financing to do business in countries which no longer "belong" to them, the LDCs and developing countries are using national sovereignty to claim the natural resources on their territory as their property. Indeed, since the 1973 success of OPEC a new consciousness has developed among exporters of non-fuel minerals towards the control of their products  . The governments of LDCs act more and more as planners and managers of their economy  . In doing so, they adopt policies to control the flow of foreign investment in ways which they believe will promote their interests. Nationalizations are, of course, the more drastic measures  . Another measure is requiring joint ventures with local equity participation and at times control in foreign investment--which can, in fact, produce silent partners in the host country dependent on the technical and market control of their foreign parent corporations. Instituting import tariffs to encourage local industry and in loco production by foreign corporations is an old protectionist method. It often produces inefficient industries depending on the protection of the tariff and pressuring for its perpetuation. Yet another method is currency policies restricting repatriation of capital or transfer of profits which, in effect, discourage foreign investment. Where there are flagrant colonial and semi-colonial pasts, some LDCs playing on guilt complex factors, also expect aid from developed countries as a repayment of former exploitation. Collision and collusion of international finance and sovereign LDCs under different circumstances give different configurations to capital investment and economic asymmetry. We should recognize the fact that in many developing countries a relatively small oligarchy of families or party and corporations control a major part of the capital and industry. Somoza and his entourage in Nicaragua, the Shah and his coterie in Iran, the "oligarchs" in El Salvador, and the hegemony of United Fruit Company in Central America, the Saudi family and Aramco in Saudi Arabia are cases in point. As events have attested over decades, these oligarchies, more often than not, have fragmented concepts of development, nationhood and independence which have resulted in combinations of: 1 - Overemphasis on industrialization (making some of them who could have been agriculturally self-sufficient, and even exporter if they had modernized their agriculture, dependent on imports of food while having on their hands economically unprofitable steel plants and foundries). 2 - Affirmation of national identity (through massive propaganda and building of impressive stadiums, government buildings, armies airlines or new capitals) or 3 - Cosmetic progress (car factories which are in reality assembly lines, production and import of consumer goods and other outward paraphernalia of modernism). International finance, which flows where it perceives high interest rates, profit and political and economic security -- and is not always accurate in its perception -- is ready to oblige and where it can influence, aggravates the consequences of the warped concepts of the national leaders. It is not certain, for example, that, in the long run, petrodollars will benefit the peoples of the territories over which oil exporting governments claim sovereignty. The industrial market economies are recycling the petrodollars by supplying the capital-surplus oil-exporting countries with arms, luxuries and industries which may not constitute viable infrastructures for continued prosperity once the oil reserves of the region are depleted. Much of petrodollars are invested in the West by a relatively small number of people who will eventually move with their investments. In capital-surplus oil-exporting countries the inflow of wealth has been so enormous compared to the number of their population that despite the fact that the ruling families have appropriated most of the wealth, enough has trickled down to make the whole population look prosperous. This, however, is not the case in many other developing countries which have adopted the free-market economy model and industrialization for their development. In these countries, when the ruling class is eager to modernize rapidly, it may find itself in the grips of exploitive capital. Indeed, the miscalculation is not a preserve of developing free-enterprise systems. Poland is paying for it. We may have to look at some of the basics of capitalism in order to define exploitive capital. "Capital is accumulated labor", said Adam Smith. Western culture had a previous image of that concept in the context of protestant ethics, which was that of a pious hardworking artisan, laboring, getting paid for his artifact and putting part of the earnings aside. Marx advised us, however, that there was more in the capital than that kind of accumulated labor. Indeed, the whole idea of capitalist protestant ethics was that the artisan should not put the saved money in the matress but use it, or have it used--to turn money into capital. Capital then has an exchange value. The question is whether the owner of that capital has a right to that exchange value or the exchange value belongs to the society which makes the exchange value possible: If A asked B to hold the other end of a log so that together they could lift it -- for which B should be paid -- should A not pay B if B lent A his capital with which A would buy a tractor and lift the log? An affirmative answer to that question would justify payment of interest on the capital. The intent here is not to get involved in already well-debated Marxian and free enterprise concepts. For now it suffices to note that Sparkasse is a prominent landmark on Alexanderplatz in East Berlin. The question, therefore, is how much is capital worth? It would not make sense if the lender whose capital helped you lift the log took the log home -- as seems to be the case of some of the borrowing countries. That doesn't seem a reasonable way for "accumulated labor" to help you. Indeed, it would be reasonable to assume that a productive capital is a capital which costs as much as labor or less. Gordon Childe, explaining the non-application of mechanical inventions in ancient Greece points out that "... landlords and capitalists preferred to invest their profits in living instruments rather than costly machines of wood; slaves were cheap." We should add, however, that the equation of capital and labor is not always a simple proposition. No amount of muscle energy can, in its raw form, hurl a satellite into the space; nor can, in the last analysis, any amount of capital replace the intellectual labor of a creative genius. The cost of labor is, of course, relative. I am not only referring to the fluctuation in the price of labor within a given market due to the dynamics of offer and demand; which, by the way, no longer solely abides by those dynamics, but is conditioned by human considerations resulting in unemployment insurance, minimum wage or welfare. I am referring to the relativity of the cost of labor from one culture to another. Obviously, it is the low cost of labor which would attract capital investment. The laborer in Hong Kong does not receive, nor does he/she expect, wages identical with those of his/her American or German counterpart. Needs and expectations of different categories of people in different cultures are different. In some cases the flow of capital into a developing economy has inflated the price of labor to levels disrupting the economic and cultural patterns of the area. What is meant by price of labor, therefore, is an optimum wage which takes into account the needs and expectations of the labor force in the context of a given culture and permits the harmonious growth of that culture's economy. This optimum wage is not the marxian subsistence level wage which, as I have discussed elsewhere, is itself relative  . It is a wage which takes the human, cultural and economic realities and potentials of a given society into consideration and in that context is compared and combined with capital investment. In its years of relative isolation, Peoples' Republic of China undertook labor-intensive projects: dams, canals, and roads were built with sheer human numbers. In that frame of mind, Chinese leadership today generally offers labor as Chinese counterpart for Western capital investment in joint ventures. Other developing countries do not and cannot always pit their labor against capital. They may not do so, or be able to do so, because of the depth of the prevailing traditional culture to which we referred earlier, the nature of their political leadership, the relationship of the ruling class with the people, and the capacity of the leadership to mobilize the population for development. Where these factors are not favorable for rapid industrialization, and yet the ruling oligarchy presses ahead with capital-intensive modernization, it thwarts the use of labor?intensive methods with the possible result of alienating large segments of the population which have remained in the traditional culture within a modernizing state. Such an economy will not be well balanced and may become explosive with two opposing popular resentments eroding the establishment; one resenting the encroachments of modernization on the traditional patterns--which brought Khomeini to power in Iran--the other resenting the segregation and lack of opportunity to participate in the process--which brought Sandinistas to power in Nicaragua. The anachronism of traditional cultures in the Third World when the Western cultures were moving towards industrialization contributed to the colonial and imperialistic patterns of economic asymmetry. The contemporary anachronism of Third World nationalism and Western financial internationalism are also contradictions in an interlocked system. Today, however, there is an additional twist to these dialectics, namely, that of the existence of an ideological third party which claims the internationalism of the proletariat but is both nationalistic and supports the national aspirations of the Third World countries -- a fact which does not promote international working class consciousness but rather national labor unions  . We are thus faced with situations where, when due to some of the factors enumerated earlier, such as the existence of a ruling oligarchy alienated from the population, a political upheaval takes place, another international political pattern sets in to perpetuate the asymmetry. The new regime, such as Sandinistas in Nicaragua, will try to make a more equitable distribution of wealth, but soon finds itself strangulated by withdrawal of international free enterprise capital and aid, and put in a situation to import tanks instead of tractors from the Socialist camp. We do not know what would have happened if immediately after expropriations in China, Cuba, or Nicaragua the expropriated companies, in most cases American, had sat down with the new regimes and worked out a compensation plan; not necessarily prompt and adequate, but "reasonable", and started new economic relations with each other. This, of course, did not happen, and could not have happened. Because the factors of sovereignty and property, past exploitations and unacceptable expropriations could not be reconciled. The regimes that had been exploited felt that they had been exploited long enough and if anybody owed anybody anything it was the exploiters. The expropriated did not really want compensation but a continuation of their privileges. These dynamics of asymmetry do not vouch for some of the theories and plans forwarded by contemporary economists. Drawing parallels between national and international capital market does not always work. The multinationals do not have a politically uniform international fabric to work on in order to equalize incomes between the developed and underdeveloped nations, and competition among multinations has not been going along the principles of free market mechanisms in the international markets--nor within national boundaries, we may add? ?but has been dominated by political manipulation  . The concept of national sovereignty which, together with industrial revolution and capitalism, produced colonialism and imperialism is today, in conjunction with ideological rifts, providing the tools by which the Third World compartments the globe. The whole picture looks like a mess. Rescheduling postpones collapse of national economies but often has no end in sight. While the creditors may be cashing some capital and interest, the situation discourages direct private investments by others. National policies of many LDCs and developing countries also discourage direct private investments. Where such investments are made, they do not always provide balanced growth for the economy of the host country. Capital inflow may reduce domestic saving incentive and may handicap the proper use of the labor force in the country. International finance at high interest rates drains the economies of the developing economies. The high price of energy has slowed down Western industrial economies. While this slow-down has reduced the demand for oil and has reduced the surplus in the current account balance of oilproducing countries, it is likely that any recovery in the industrial countries would increase their demand for energy and thus result in another increase in the price of oil. To keep inflation down, industrial countries-notably the US--have raised their interest rates  . A fact which has contributed to the slow down of their economy but has increased the return on the surplus capital of the oil-producing countries, and has made the burden of borrowing on developing countries even heavier. The high rate of interest in the U.S. has also attracted foreign capital to the U.S., increasing the demand for the dollar and hence raising its exchange rate, contributing further to the increase in the value of the surplus capital of oilexporters--which is mostly in dollars--and the hardship of oil-importing countries. Some solutions to these problems have been devised. Some are more of a stop-gap nature, holding the pieces together, such as the rescheduling of debts mentioned earlier, the IMF low-interest rates for oil-importing LDCs, or the European Monetary System's "supersnake". Others may become foundations for future structures such as the International Centre for the Settlement of Investment Disputes (ICSID), or mechanisms in different developed free?market economies to provide political risk insurance for investments abroad such as the U.S. Overseas Private Investment Corporation (OPIC)  . Then there are certain other proposals and projects put forth from different quarters which may have some potentials for compromise. For example, many Western economists have conceived international frameworks for regulating the activities of multinational corporations and movement of capital and technology, such as incorporation of multinational corporations under international law and fines for them where they infringe accepted norms  , creation of a superanational body which would intervene in the conflicts between multinationals and nation-states  , or an international agreement to provide for a superanational body and a set of laws to charter and regulate the multinational corporations' operation in those developing countries adhering to that agreement  . These ideas have some common grounds with the provisions of the draft Treaty on the Law of the Sea, which the Group of 77 has been promoting over the past decade. The Authority, the Enterprise and the Seabed Disputes Chamber, which are provided for in that Treaty, will be international bodies regulating the exploitation of the natural resources of the ocean  . "The sea-bed, ocean floor, and subsoil beyond the limits of national jurisdiction (the Area), as well as the resources of the Area, are the common heritage of mankind. The Area shall not be subject to appropriation by any means ... and no State shall claim to exercise sovereignty or sovereign rights over any part of the Area." This resolution reminds us of Jean Jacques Rousseau's famous statement that "the earth belongs to no one and the fruits of it to all". Indeed, if the resources of the seas are the common heritage of mankind, why should the resources of the land not be too? One of the concerns of the Group of 77 in regulating the exploitation of the resources of the oceans has been to limit its output in order to protect the international commodity market prices for metals produced by some of the members of the Groups such as Chile, Peru, Zambia, Columbia or Zaire. This concern inspired the move within the Group of 77 at the UNCTAD IV meeting in Nairobi in 1976 to create the Integrated Program for Commodities. The program did not become effective because its Common Fund for warding off price fluctuations was not adequately funded. Would it not be more efficient to put the land resources under the control of the same authority as the seabed resources so that an international equilibrium between land and sea resources could be achieved? Such an authority could also oversee the exploitation and distribution of energy resources. This internationalization of global resources would be accompanied by licencing of the operations of the corporations engaged in the exploitation of the natural resources with a view to assure environmental protection and balanced and integrated development projects within different regions. The process will not eliminate economic asymmetry, but will help better plan the global economy. It would recognize the relationship between the price of labor and capital, and take that relationship into account when chartering projects for development, whether those projects are run by multinational corporations or other international institutions. A case in point is the development of Sub-Saharan Africa. In its assessment, the World Bank presents a sobering picture of scarcity of capital for such development and the need for tapping the human resources of the continent  . Of course, if an international regulatory body could oversee the global natural resources along the lines of the Law of the Sea Treaty, it could redistribute funds for certain regional developments? ?above all, for that of human resources. This could take the form of a World Development Fund as proposed by the Brandt Commission  . However, the idea of this international regulatory body--which is a variation on the theme of the Law of the Sea Treaty and other suggestions for global control of the interaction between sovereign states and multinational corporations--is not to manipulate the flow of the different components of production but to eliminate political barriers on their way. With the newly rediscovered movements of labor and unhampered flow of capital, technology and management, we may see regions which have natural resources and market potentials attract the other components of production. Needless to say, such a scheme will call for extensive social programs for education, health, social security, and social justice; but we better not get into that. For now, we face the more drastic problem which all the other proposals we have drawn on have faced: that of finding a way of putting the bell around the neck of the cat. We have to realize, of course, that the major economic powers, and especially the super?powers, have enormous natural resources within their sovereign territories. Global solutions, such as the one proposed here, often suffer from the assumption that the world could be run along rational systems governed by reasonable and knowledgeable leaders and decision-makers; a rather unreasonable assumption. All we need to do is to compare the global military budget with that of international economic aid to realize that as we are trying to keep the ceiling from falling the torrent is washing the foundation of the house away. P.S. As I put a full-stop to this paper, I hear the news of the Argentinian landing in the Falkland Islands. Recent prospects of possible offshore oil deposits around the islands may have been partly the cause of the crisis. If my proposals for the internationalization of natural resources was already in place, the conflict would probably have been averted! [*] This paper was presented to the Session on Economic Asymmetry, International Political Science Association, XII World Congress, Rio de Janeiro, August 1982. Raymond Vernon (ed. ), The Oil Crisis, New York, Norton, 1976; and "Storm over the Multinationals: Problems and Prospects", in Foreign Affairs , January 1977, pp. 243?62. Sylvia Ann Hewlett, "Human Rights and Economic Realities: Tradeoffs in Historical Perspective", in Political Science Quarterly, 94(3), 1979, pp. 453?473. See Vladimir Lenin, Imperialism: The Highest Stage of Capitalism , Ch. 4; Arthur I. Bloomfield, Patterns of Fluctuation in International Investment before 1914, Princeton, N.J., International Finance Section, Princeton U., 1968; and Joseph LaPalombara and Stephen Blank "Multinational Corporations and Developing Countries", in Journal of International Affairs , 34, Spring 1980, pp. 119?136. The term capital investment will be used in this paper in its broad connotation referring to direct private investment and transfer of capital as loans. Distinctions between investments and loans will be made as the case arises. 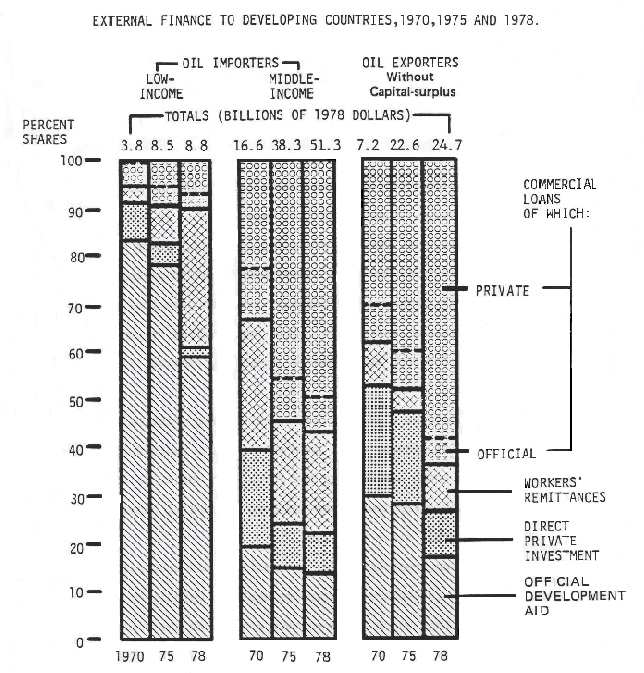 Opec Direct Investment in the United States: 1974-79 Transactions , United Nations Centre on Transnational Corporations, based on national sources. Some of the petrodollar nouveaux riches, such as the former Shah and Qaddafi, with visions of grandeur in the modern sense, started earlier to invest in Western industries. The World Bank, World Development Report 1981, p. 54. The World Bank makes a distinction between low-income countries--those with 1979 per capita GNP less than $370--and "middle-income countries"--those developing countries with per capita incomes above $370. This distinction will be reflected in references made to World Bank sources and where it is necessary to make a distinction between LDCs (low-income) and developing countries (middle-income). Aid from oil-producing countries with capital surpluses amounted to 3% of their GNP in 1980 as compared to 0.27% for the U.S.A., 0.12% for the Socialist block, and 0.43% for OECD. Yasuoki Takagi "Aid and Debt Problems in Less-Developed Countries", in Oxford Economic Papers, 33, July 1981, p. 325. See Dragoslav Avramovic, Debt Service Capacity and Postwar Growth in International Indebtedness, Baltimore, Johns Hopkins Press, 1958; D. Avramovic et al, Economic Growth and External Debt, Baltimore, Johns Hopkins Press, 1964; Raymond Mikesell, The Economics of Foreign Aid, Chicago, Aldine, 1968; Keith Griffin, International Inequality and National Poverty , London, Macmillan, 1978. See notably P.T. Bauer and Basil S. Yamey, The Economics of Under-developed Countries, Chicago, University of Chicago Press, 1957; Bauer, Dissent on Development Economics, Cambridge, Mass, Harvard University Press, 1972; Keith Griffin and J.B. Enos, "Foreign Assistance: Objectives and Consequences", in Economic Development and Cultural Change, 18, April 1970, pp. 313-27; Griffin, "Foreign Capital, Domestic Savings and Economic Development", in Bulletin of the Oxford University Institute of Economics and Statistics , 30, 1970, pp. 99-112; Gustave F. Papanek, "The Effect of Aid and Other Resource Transfers on Savings and Growth in Less Developed Countries", in Economic Journal, 82, September 1972, pp. 934-50; "Aid, Foreign Private Investment, and Growth in Less Developed Countries", in Journal of Political Economy, January/February 1973, pp. 120-30; "The Effect of Aid and Other Resource Transfers on Savings and Growth in Less Developed Countries: An Interchange", in Economic Journal, 83, September 1973, pp. 70-74; Umesh C. Galati, "Effects of Capital Imports on Savings and Growth in Less Developed Countries", in Economic Inquiry, 16, October 1978, pp. 563-569; "Effect of Capital Imports on Savings and Growth: Reply", in Economic Inquiry, 18, July 1980, pp. 519-522; and Rati Ram, "Foreign Capital, Savings and Economic Growth: An Agnostic Note", in Economic Inquiry, 18, July 1980, pp. 514-518. World Bank World Development Report, 1981,Page 53. See, for example, Syed Ashraf Ali, Labor Migration From Bangladesh to the Middle East, World Bank, 1981, pp. 89?90. Roger S. Leeds, "External Financing of Development: Challenges and Concerns", in the Journal of International Affairs, 34, Spring 1980, p. 25. Volker Bornschier, "Multinational Corporations, Economic Policy and National Development in the World System", in International Social Science Journal , 32(1), 1980, pp. 158?72. Exernal Public Debt and International Reserves, The World Bank: World Development Report 1981, pp 162-3. Malcolm Gillis, "The Role of State Enterprises in Economic Development", in Social Research, 47(2), Summer 1980, pp. 248?289. Tsurumi Yoshi and Edward M. Graham, Multinational Management: Business Strategy and Government Policy, Cambridge, Mass, Ballinger, 1977, p. 270 et. seq. This fact is reflected in the orientation of the aid programs of former colonial powers, whose recipients are, for the greater part, the former territories of those powers. Curiously enough, however, it is developed economies with little colonial past, such as Sweden, Denmark and Norway, which earmark a relatively larger percentage of their GNP for aid to LDCs. See Gustave F. Papanek, Pakistan's Development, Social Goals and Private Incentive, Cambridge, Mass., Harvard University Press, 1967, pp. 67-8 on the controlling role of a few families and foreign corporations of the private industrial assets in Pakistan. Poland's Trade and External Debt with Non-Communist Countries 1972-1981 , U.S. State Department, January 1982. Karl Marx, Grundrisse: Foundations of the Critique of Political Economy , (1857-8), translated by Martin Nicolaus, New York: Vintage Books, 1973, p. 253 et seq. Balance of Payments and Debt Service Ratios, The World Bank: World Development Report 1981, pp. 158-9. V. Gordon Childe, What Happened in History, Baltimore, Penguin, 1954, p. 253. A. Khoshkish, The Socio-Political Complex, Oxford, Pergamon, 1979, p. 273. Stephen H. Hymer, "International Politics and International Economics: A Radical Approach", in L. Lindberg, R. Alford, C. Crouch and C. Offe (eds. ), Stress and Contradiction in Modern Capitalism, Lexington, Mass, Lexington Books, 1975, pp. 355-72. See, for example, Charles P. Kindleberger, American Business Abroad , New Haven, Yale University Press, 1969; -- International Economics , Homewood, Ill., Richard D. Irwin, 1973; Kindleberger and Bruce Herrick, Economic Development, 3rd Ed., New York, McGraw-Hill, 1977; and Richard E. Caves, International Trade, International Investment, and Imperfect Markets, Princeton, International Finance Section, Department of Economics, Princeton University, 1974. Where the interest rate is not in direct control of the government, such as in the USA, the rates also remain high when there is a huge deficit in the national budget and sends the government borrowing on the money market. Some of these were covered in my paper "International Law of Investment", presented to the 21st Annual Convention of the International Studies Association in Los Angeles in 1980. Edith Penrose, The Large International Firms in Developing Countries: The International Petroleum Industry, London, George Allen and Unwin, 1968; also The United Nations Report on International Corporations in World Development, U.N. Document No. 4, 74. II. A. 9, pp. 336?48. Raymond Vernon, Sovereignty at Bay, New York, Basic Books, 1971. George W. Ball, Diplomacy for a Crowded World: An American Foreign Policy , Boston, Little Brown, 1976, pp. 278?279. See V.E. McKelvey, "Seabed Minerals and the Law of the Sea", in Science , July 25, 1980; Elliot Richardson, "Power, Mobility and the Law of the Sea", in Foreign Affairs, April 1980. The World Bank, Accelerated Development in Sub-Saharan Africa: An Agenda for Action, Washington, 1981. 1nternational Commission on International Development Issues, North-South: A Program of Survival, Cambridge, Mass., MIT Press, 1980.